The year 1972 marked the beginning of the vineyard itself with the planting of Chardonnay, Riesling, Cabernet Sauvignon and Pinot Noir (the last grafted to chardonnay in 1989). Unusual for North Coast viticulture at the time, the initial twenty acres were planted on their own roots. These vines were established under difficult conditions, with some slopes angling over 30%: today they are lush and healthy. The cooler mountain climate is an additional factor which produces grapes of intense flavor, structure and longevity. 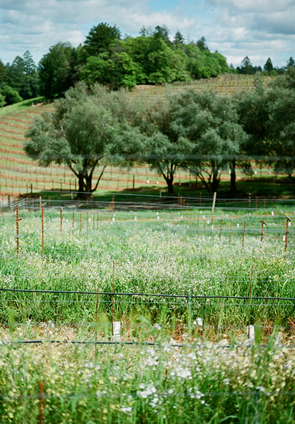 Today the vineyard consists of thirty four acres in various stages of production dating back to 1972. In addition to the 6.25 acres of Riesling, 10.25 acres of Chardonnay and 13 acres of Cabernet Sauvignon, the vineyard now has one acre of cabernet franc and 3.75 acres of merlot. Stuart Smith chose specific slopes with different exposures for specific varietals: eastern exposure for the Riesling, southern and western exposures across flat stretches for the cabernet sauvignon; the coolest north-facing slopes for the chardonnay. The history of international viticulture also supported his early belief in the potential of these mountain grapes which would have to "struggle" to produce. Drip irrigation was used to establish the vineyard but today it is dry-farmed. The vines send their roots deep to search for water and nutrients, only producing the precise amount of fruit exactly appropriate for their vigor, small berries with a large skin-to-juice ratio.